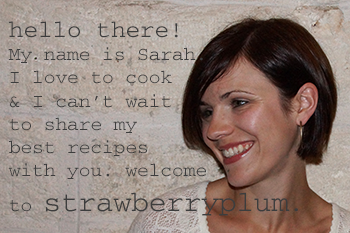 In December, cooking demands a lot of you. You’ve got to plan ahead, come up with elegant menus for holiday entertaining. You’re making a million trips to a thousand different grocery stores for just the right ingredients and forcing yourself to bake cookies uniform and cute enough to be giftable. Then January rolls around and it’s time to start demanding a lot of what you’re cooking. 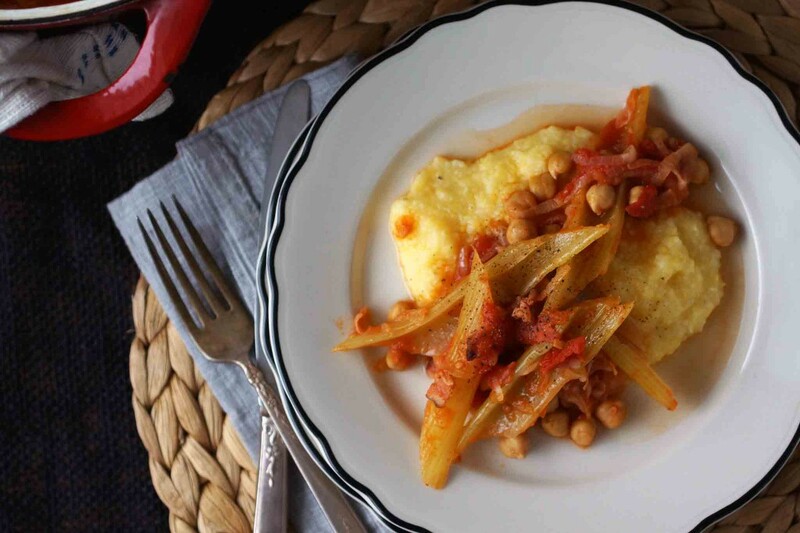 You want a dinner that provides comfort from the cold while being relatively healthy, something simple that won’t require dirtying a stack of pots and pans or hours of time in the kitchen, and meals that can be thrown together without a trip to the supermarket. Believe it or not, this dish fulfills all of our needs! It’s an adaptation of Marcella Hazan’s recipe for braised celery I saw a while back, that stuck in my head. 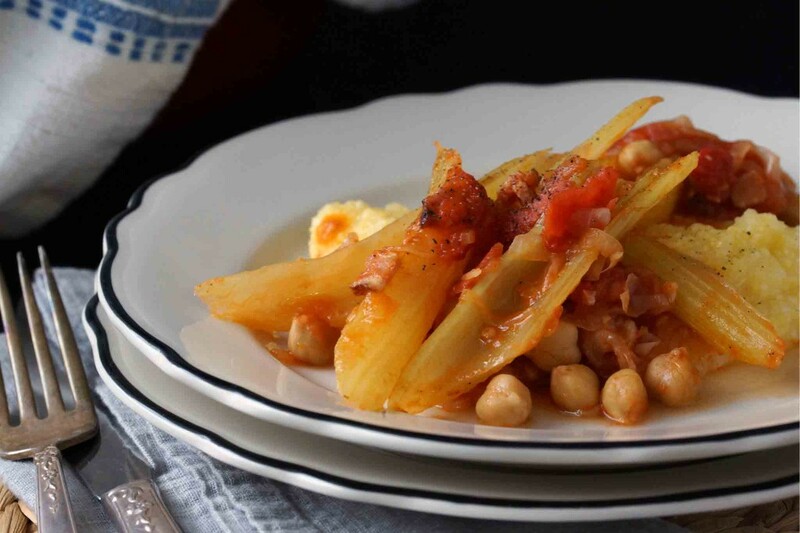 It sounded odd to me at first–celery braised with tomatoes and bacon until tender–but I was intrigued and found myself making it one night when fridge was nearly barren, but I couldn’t bear the thought of running to the store. 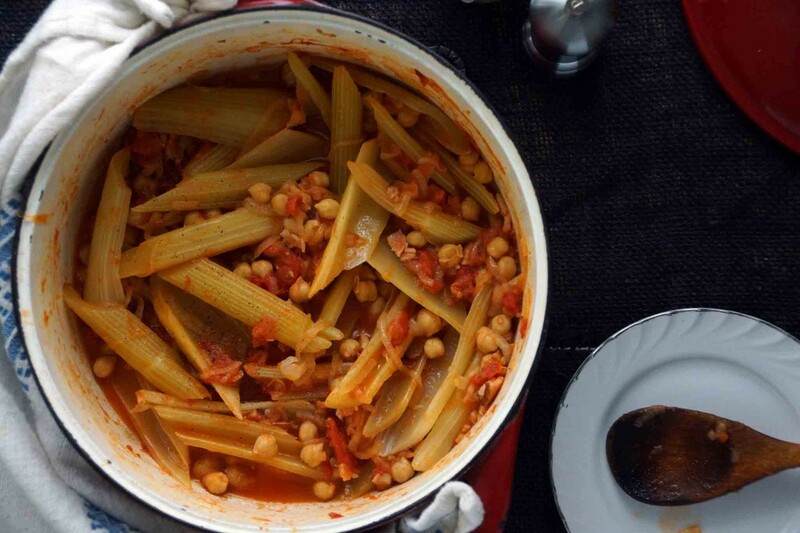 It ended up being everything that I wanted: warm and comforting, pretty healthy, 1 pot, very little hand-on time, and made with staple ingredients I almost always have even when it seems like I have nothing. Ready? Let’s do dinner! 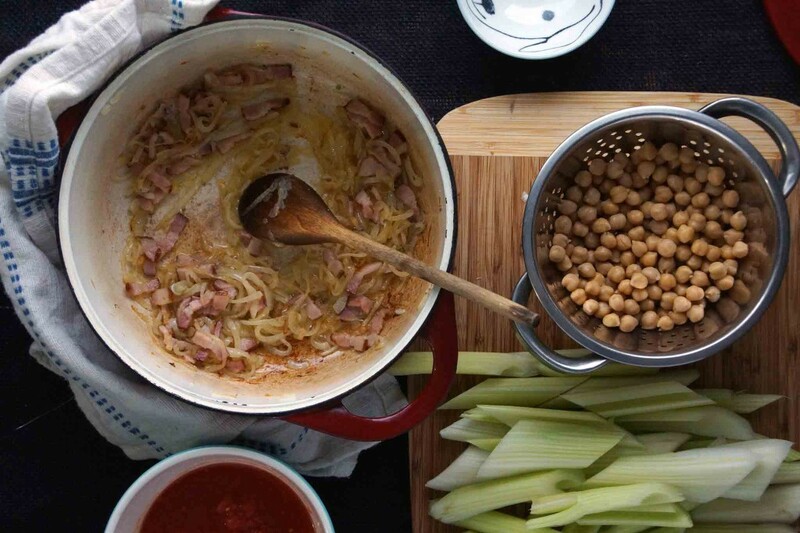 Grab a head of celery, an onion, a can of tomatoes, chickpeas, and a couple of strips of bacon. The first thing you’ll want to do is prep the celery. Pull the stalks apart. You can save the leaves and really small inner stalks for your next batch of stock. Wash the stalks and then go after them with a vegetable peeler and remove all of the tough outer strings. Cut the stalks on a diagonal in 3 inch lengths. Slice the onion and get cooking. Sweat the onion down until the slices are wilted and are just starting to get a little color. Stir in pieces of bacon and keep cooking until the bacon loses its raw appearance. Now stir in the celery, chickpeas, and tomatoes. Simmer and cover–your (not-so) hard work is done. 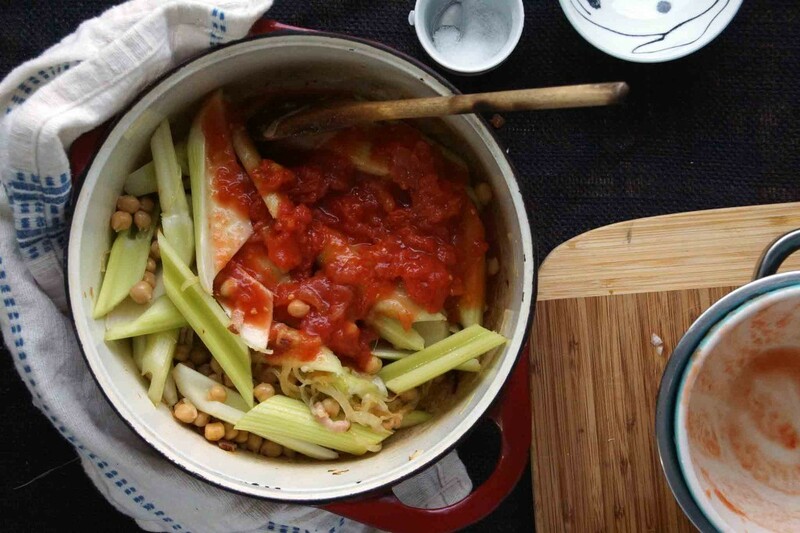 Cook until the celery is tender and has soaked up all of the rich, smoky tomato broth and the chickpeas and tomatoes have united to become a thick, chunky sauce. I think you’ll be surprised at how good these simple ingredients can taste with just a little care (and bacon!). January, thanks for giving back. 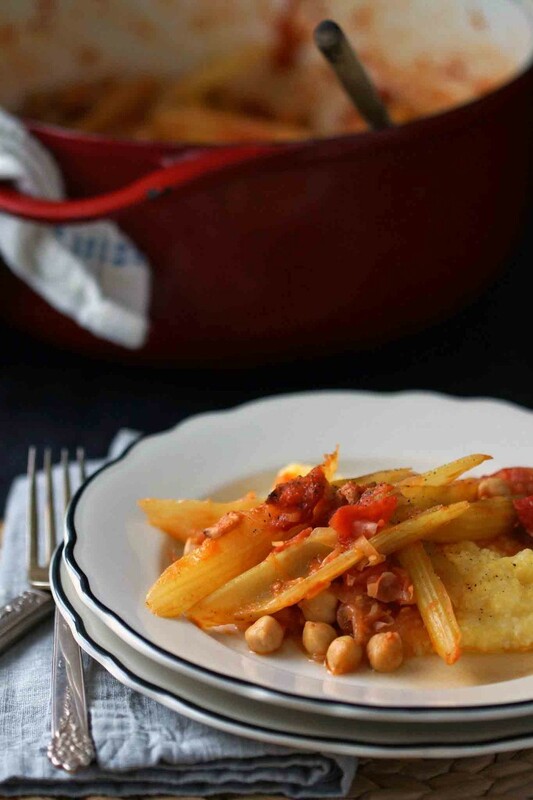 Serve the braised celery as a side dish or, as I do, over a bowl of polenta as a satisfying main course. Separate the celery stalks. Remove the leaves and reserve for another use (a batch of stock, perhaps?) along with the really pale, small inner stalks. Using a vegetable peeler, peel away the outer layer of each stalk of celery, removing the tough strings. Cut each stalk, on the diagonal, into 3 in. pieces. Heat the olive oil over medium heat in a large pot or wide skillet. Add the onion and sauté until wilted and slightly golden, 4-5 minutes. Add the bacon and cook until it loses its pale, raw appearance, 2-3 minutes. 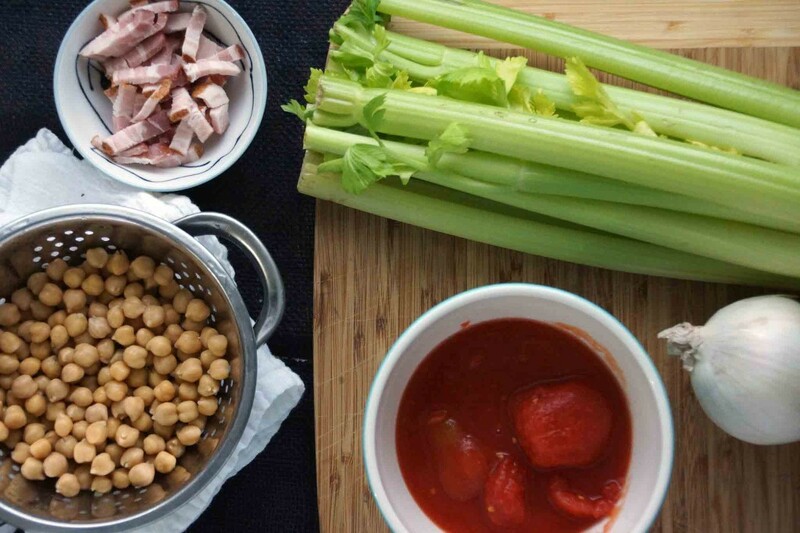 Add the celery, chickpeas, crushed tomatoes, and ½ c. water. Season with a couple of pinches of salt, bring to a boil, then reduce to a simmer. Cover the pot and simmer until the celery is almost thoroughly tender, about 45 minutes. Uncover, taste and adjust seasoning if needed, and continue to simmer until the celery is completely tender and the liquid has nearly cooked off, about another 15 minutes. This looks so delicious and comforting and you’re right – even when I have nothing I almost always have these ingredients! What a great meal idea!